Jose Mourinho was sent off and Chelsea ended the match with nine players as Fabian Delph struck a late winner to dent the leaders' title hopes at Aston Villa. Delph struck eight minutes from time to give Villa a morale-boosting 1-0 win. The result means Chelsea surrendered the initiative to Manchester City in the title race. Manuel Pellegrini's men, who beat Hull in the lunchtime kick-off, are six points behind Chelsea, but the fact that they have three matches in hand makes them favourites - as Mourinho has been suggesting all along. The match was a largely dull affair until Willian was shown a second yellow card for a push on Delph. Mourinho reacted angrily towards fourth official Jon Moss, but his mood darkened moments later when Delph clipped a clever backheel beyond Petr Cech. But, as is always the case with Mourinho, more drama was to come. In injury time the Portuguese raced on to the pitch to confront referee Chris Foy following his decision to show Ramires a straight red for a tackle on Marc Albrighton. Foy did not like what he saw and he sent Mourinho off. Further censure from the Football Association may follow, and all in all this was a trip to the Midlands that the ex-Real Madrid man will want to forget quickly. Tempers threatened to boil over - just like they did in the reverse fixture - early on when Nathan Baker clattered into Fernando Torres and received a booking in the fourth minute. Willian received a yellow soon after for an equally poor challenge on Karim El Ahmadi. Nothing else of note took place in the first half an hour as a dull match looked on the cards. Gary Cahill and John Terry prevented Christian Benteke from getting into the game while Fernando Torres could not find any space at the other end. The only time the Spaniard did find room in the box, he ploughed a shot into the Holte end and the Villa fans responded with taunts about the striker's Â£50million price tag. Instead it was Benteke who created the only real chance of the first half when he turned and smacked a low volley an inch wide of Peter Cech's goal. Nemanja Matic thought he had given Chelsea the lead just before the break, but Foy correctly chalked off the midfielder's tap-in as he handled the ball before shooting. Those Villa fans who had not escaped early for a half-time pie held their breath in injury time as Joe Bennett took down masked man Ramires as he raced through, but Foy flashed a yellow card when Mourinho, gesticulating angrily on the touchline, clearly wanted a red. The intensity of the game improved in the second half and Chelsea were the main protagonists. Brad Guzan clawed the ball off his own line following a mis-cued clearance from El Ahmadi. Branislav Ivanovic skipped over Delph and attempted to square the ball to Torres in the box but Baker came to the rescue. Guzan got down well to deny Oscar, but all of a sudden Villa went on the attack through Benteke. Chelsea's defence backed off the Belgian and he struck a low curling effort which almost skimmed the outside of the post. Mourinho had seen enough of Torres and he replaced the Spaniard with Demba Ba while Andre Schurrle came on for Oscar. The Chelsea manager's plans were then thrown into disarray when Willian earned a second yellow for pushing over Delph. 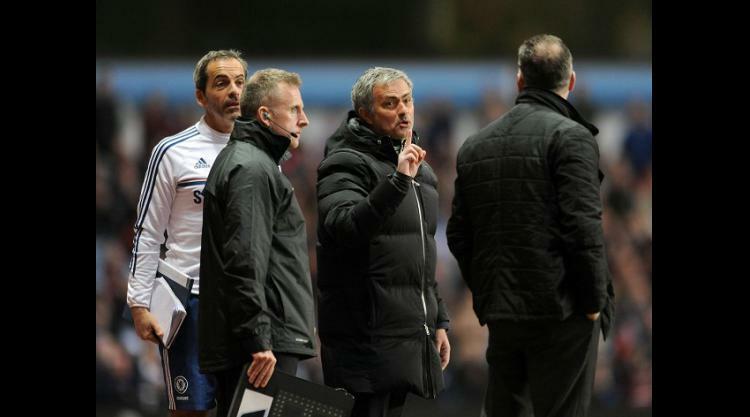 Mourinho disagreed with the decision, venting his fury towards fourth official Moss. The home crowd found their voice and urged Villa to push for a winner. Delph did well to gain a yard on Gary Cahill but he pulled his shot wide. Ron Vlaar was the next to miss, heading wide from close range. Time was slipping away, but Villa found the goal they craved. Delph won the ball in midfield and fed the ball to Albrighton, who returned the ball to the former Leeds midfielder, who backheeled superbly past Cech. Paul Lambert sprinted off the bench with his arms aloft in celebration. Moments later he seemed to have disagreement with Mourinho, but the two quickly made up. Delph could have made it a perfect evening with a second but instead he struck the bar. There was still time for more drama. Ramires was sent off for a sliding tackle on El Ahmadi. The Brazilian clashed with a furious Leandro Bacuna, who raced over to the midfielder and the pair jostled on the pitch. More confrontation followed in the final minute of injury time as Mourinho marched on to the pitch to vent his fury at Foy. The referee was having none of it and he ordered the Portuguese down the tunnel. After a minute of hesitation, the Chelsea boss finally walked off as play continued. Villa repelled one last Chelsea attack and Foy blew his whistle.